ww2dbaseCommissioned into service in Sep 1944, USS Charr departed Connecticut, United States in Nov 1944 for the Pacific Ocean, reaching Pearl Harbor, Hawaii, United States on 9 Dec. She began her first war patrol on 30 Dec in waters off Indochina. On 29 Jan 1945, her commanding officer daringly remained at anchor only one mile from the Indochina coast for four hours while a team of two men was dispatched ashore, via a rubber boat, to rescue a downed PBY Catalina airman; luckily for the submarine and her crew, this did not attract enemy fire. She remained in the area through the next few days in an attempt to contact, unsuccessfully, the remaining members of the aircraft's crew. In Feb, she escorted the damaged Dutch submarine HNLMS Zwaardvisch through the Java Sea and Lombok Strait to Fremantle, Australia, arriving on 3 Mar and ending her first war patrol. USS Charr departed Fremantle for her second war patrol in Mar 1945. The first portion of the second war patrol was spent in Flores Sea, Java Sea, and South China Sea, during which she sank the Japanese cruiser Isuzu which had shortly before been damaged by wolfpack mate USS Gabilan; Isuzu also presented her first kill. During the second portion of the patrol, she performed lifeguard duty in waters southeast of Taiwan, during which she rescued one downed P-51 pilot. She departed Fremantle on 15 Jun 1945 for her third and final war patrol in the Gulf of Siam region as a member of a wolfpack; while USS Bluefish, a member of the wolfpack, sank a Japanese submarine, USS Charr did not gain credit for any sinkings. ww2dbaseAfter the end of the Pacific War, USS Charr received repairs at Pearl Harbor and then conducted training at Guam, Mariana Islands. She was based out of San Diego, California, United States from Jan 1946, patrolling nearby waters and conducting simulated war patrols as far west as Asia. She received an overhaul at the Mare Island Naval Shipyard in Vallejo, California in mid-1949 before returning to training duties. She operated out of Pearl Harbor and the west coast of the United States during the early years of the Korean War, and then, after conversion to a Four Engine Fleet Type Snorkel Submarine, she served in Korean waters between 1952 and 1953. In 1954, she visited Acapulco, Mexico in Jan and then cruised in Asian waters; during the latter, she hosted Chinese President Chiang Kaishek on his first submarine cruise on 9 Nov. In the 1950s and the 1960s, she served generally in the west coast of the United States and in Asian waters, visiting ports such as Kobe and Yokosuka, Japan. In 1965, she operated in direct support of American forces fighting in Vietnam. On 1 Jul 1966, she was reclassified an auxiliary submarine and received the new designation AGSS-328. She was decommissioned on 28 Jun 1969 and eventually was sold for scrap in 1972. 24 Sep 1942 The plan for future submarine Bocaccio was renamed submarine Charr. 26 Aug 1943 The keel of submarine Charr was laid down by the Electric Boat Company in Groton, Connecticut, United States. 28 May 1944 Submarine Charr was launched, sponsored by Mrs. William Orkney. 23 Sep 1944 USS Charr was commissioned into service at 1030 hours at the US Submarine Base, New London, Connecticut, United States with Commander Francis Boyle in command. 5 Nov 1944 USS Charr departed New London, Connecticut, United States. 9 Dec 1944 USS Charr arrived at Pearl Harbor, US Territory of Hawaii. 30 Dec 1944 USS Charr departed Pearl Harbor, US Territory of Hawaii for her first war patrol. 29 Jan 1945 USS Charr anchored one mile off the Indochina coast for four hours during daylight while a team was dispatched ashore to rescue a downed airman. 3 Mar 1945 USS Charr arrived at Fremantle, Australia, ending her first war patrol. 27 Mar 1945 USS Charr departed Fremantle, Australia for her second war patrol. 7 Apr 1945 USS Charr sank Japanese cruiser Isuzu, which had just been damaged by a torpedo from USS Gabilan, with three hits out of five torpedoes fired. 10 Apr 1945 USS Charr sank a Japanese freighter with her deck gun in the Java Sea. 14 Apr 1945 USS Charr began laying naval mines off Pulo Island, Vietnam. 15 Apr 1945 USS Charr completed minelaying off Pulo Island, Vietnam. 16 Apr 1945 USS Charr fired 10 torpedoes at a Japanese freighter, none of which hit. 20 Apr 1945 USS Charr arrived at the naval base at Subic Bay, Luzon, Philippine Islands. 24 Apr 1945 USS Charr departed the naval base at Subic Bay, Luzon, Philippine Islands. 21 May 1945 USS Charr arrived at the naval base at Subic Bay, Luzon, Philippine Islands, ending her second war patrol. 15 Jun 1945 USS Charr departed the naval base at Subic Bay, Luzon, Philippine Islands for her third war patrol. 26 Jul 1945 USS Charr arrived at Fremantle, Australia, ending her third war patrol. 29 Aug 1945 USS Charr departed Fremantle, Australia. 27 Jan 1946 USS Charr arrived at San Diego, California, United States. 1 Apr 1946 Commander Jack Seymour became the commanding officer of USS Charr. 4 Oct 1946 USS Charr departed San Francisco, California, United States for a simulated war patrol. 27 Jan 1947 USS Charr arrived at San Diego, California, United States, ending the simulated war patrol. During the patrol she visited Pearl Harbor, US Territory of Hawaii; Subic Bay, Philippine Islands; Shanghai and Qingdao, China; and Yokosuka, Japan. 19 Jun 1947 Commander Oliver Bagby became the commanding officer of USS Charr. 6 Jul 1949 USS Charr arrived at Portland, Oregon, United States. 23 Aug 1950 USS Charr received the Marjorie Sterrett Battleship Fund Prize; she was the first submarine to receive the prize. 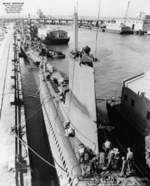 10 Jul 1951 USS Charr arrived at Mare Island Naval Shipyard, Vallejo, California, United States to be converted to a Four Engine Fleet Type Snorkel Submarine. 19 Nov 1951 USS Charr completed her conversion at Mare Island Naval Shipyard, Vallejo, California, United States. 26 Mar 1952 USS Charr departed San Diego, California, United States for Korea. 2 Oct 1952 USS Charr arrived at San Diego, California, United States. 18 May 1953 USS Charr arrived at San Francisco Naval Shipyard, California, United States for overhaul. 14 Oct 1953 USS Charr completed her overhaul at San Francisco Naval Shipyard, California, United States for overhaul. 22 Nov 1953 USS Charr sponsored the Girl Scout Mariner Ship 36 Sea Tiger of Pasadena, California, United States; the ceremony was held aboard USS Charr at Long Beach, California. 13 Jun 1954 USS Charr departed San Diego, California, United States for Yokosuka, Japan. 9 Nov 1954 USS Charr hosted Chinese President Chiang Kaishek; it was his first cruise in a submarine. 7 Dec 1954 USS Charr arrived at San Diego, California, United States. 7 Mar 1955 Commander Oliver Bagby of USS Charr became an honorary girl scout and honorary officer of the Girl Scout Marine Ship 36 Sea Tiger. 14 Jun 1955 USS Charr entered Puget Sound, Washington, United States. 30 Jun 1955 USS Charr arrived at Mare Island Naval Shipyard, Vallejo, California, United States. Lieutenant Commander R. A. Harris relieved Commander W. A. Whitman as the new commanding officer. 29 Nov 1955 USS Charr departed Mare Island Naval Shipyard, Vallejo, California, United States. 4 Jun 1956 USS Charr departed San Diego, California, United States for the First Fleet Pacific Training Exercise in San Francisco Bay area to the north. 8 Aug 1956 USS Charr took part in the commencement of the Seattle Sea Fair. 22 Mar 1957 USS Charr began a tour in Asian waters. 3 Jun 1957 USS Charr arrived at Hong Kong. 8 Jun 1957 USS Charr departed Hong Kong. 27 Jun 1957 Lieutenant Commander Thomas Auger became the commanding officer of USS Charr. 14 Oct 1957 USS Charr arrived at San Diego, California, United States. 3 Jun 1958 USS Charr departed Mare Island Naval Shipyard, Vallejo, California, United States for San Diego. 11 Sep 1958 USS Charr departed San Diego, California, United States for exercises with Canadian Navy vessels. 6 May 1959 USS Charr began a tour in Asian waters. 28 Oct 1959 USS Charr arrived at San Diego, California, United States. 11 Jul 1960 USS Charr departed San Diego, California, United States for Olympia, Washington, United States for the Capitol Lake Fair Celebration. 18 Jul 1960 USS Charr departed Olympia, Washington, United States. 22 Jul 1960 USS Charr arrived at San Francisco Naval Shipyard, California, United States for overhaul. 5 Dec 1960 USS Charr completed her overhaul at San Francisco Naval Shipyard, California, United States. 12 Dec 1960 USS Charr departed San Francisco, California, United States. 14 Dec 1960 USS Charr arrived at San Diego, California, United States. 24 Feb 1961 USS Charr departed San Diego, California, United States for a tour in Asian waters. 17 Aug 1961 USS Charr arrived at San Diego, California, United States. 25 Aug 1961 Lieutenant Commander Harold Skelly became the commanding officer of USS Charr. 26 Sep 1961 USS Charr suffered a ruptured hose that flooded the maneuvering room, require her to be towed to San Diego and later San Francisco, California, United States for repairs. 9 Nov 1961 USS Charr completed repairs and departed from San Francisco, California, United States. 17 Mar 1962 USS Charr arrived at San Diego, California, United States. 17 May 1962 USS Charr arrived at San Diego, California, United States. 3 Nov 1962 USS Charr departed San Diego, California, United States for a tour in Asian waters. 10 May 1963 USS Charr arrived at San Diego, California, United States. 1 Jul 1963 USS Charr departed San Diego, California, United States for Eureka, California. 10 Jul 1963 USS Charr arrived at San Francisco Naval Shipyard, California, United States for overhaul. 29 Nov 1963 USS Charr arrived at San Diego, California, United States. 29 Mar 1965 USS Charr recovered downed airman Commander J. H. Harris in the Gulf of Tonkin off Vietnam. 30 Jun 1966 USS Charr arrived at Mare Island Naval Shipyard, Vallejo, California, United States for overhaul. 1 Jul 1966 USS Charr was reclassified an auxiliary submarine and redesignated AGSS-328. 12 Dec 1966 USS Charr completed her overhaul at Mare Island Naval Shipyard, Vallejo, California, United States. 13 Feb 1967 USS Charr departed San Diego, California, United States for Puget Sound, Washington, United States. 23 May 1967 USS Charr departed San Diego, California, United States for Asian waters. 28 Jun 1969 USS Charr was decommissioned from service and placed into reserve. 20 Dec 1971 Submarine Charr was struck from the US Naval Register. 17 Aug 1972 Submarine Charr was sold for scrap.